When did the gulf grow so wide between The Advertiser and The ABC? The beauty of consuming news from a smartphone, is that you can get a quick overview of the main topics of the day and then choose to dive deeper into the stories that interest you most. 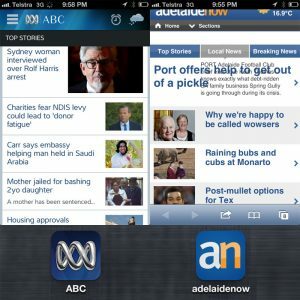 I’ve noticed lately that the ABC has recently upgraded its smartphone app, meaning its daily headlines are comprehensive and nourishing. 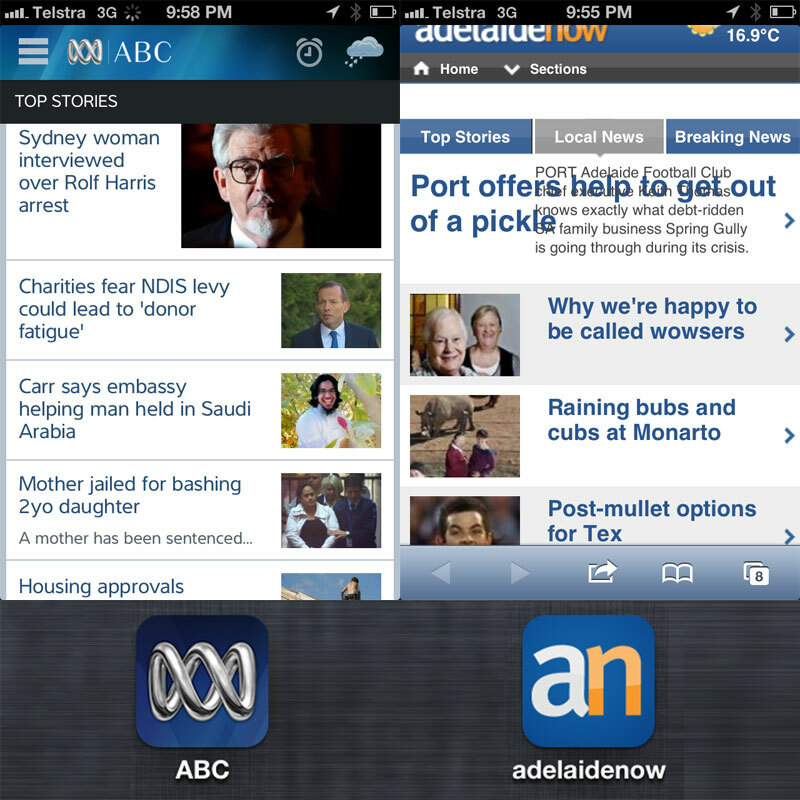 It is now in starker contrast than ever before against the icon that sits next to it on my phone for Adelaide Now, the Advertiser online news service. Let me compare headlines at the time of writing this. As you can see, the ABC news comes across as a nutritious offering against Adelaide Now’s confection. Admittedly, it is a cozy and comforting time for my PR friends because the ‘Tiser is desperate to print their ‘fluff’ and ‘spin’ so it can fill its columns on behalf of advertisers. However, as a former journalist, I lament the seeming paucity of journalistic resources at The Advertiser where its role in facilitating public discourse has become reduced to serving up sensationalist mush or scraped together sports leftovers. And, as a South Australian, I fear that politicians and lobby groups hold more power than ever due to lack of serious scrutiny. Do we need to prepare for more State Bank horrors and nasty backroom deals against the public interest? I don’t think your analysis is dubious at all. You may not be able to judge a book by its cover, but news services invite us to judge them by their headlines. It may be the case (and it’s idle speculation) that one service lists its headlines chronologically or at least with editorial oversight, while the other ranks them by popularity. The tiser’s reportage of sport as though it’s actually news leaves me nonplussed at best. Even in local news, running a football story as your top story, well, I just think it shows a serious lack of judgment by either the readership, the editorial team, or both. In a one-newspaper town, I’m not sad to see the relevance of print diminishing.